This dreamy dreamer, smiling above her table arrangement of daisies, is Esther Miriam Schwebel, my great grandmother. I guess this photo was taken in the early 1900s, when she was a busy mother of four, somewhere in Newtown, in inner city Sydney. She was born in 1870 but I’m not sure where. Other than that, I don’t know very much about her. As a child, I was always aware of her existence; I knew that she was Jewish, of Polish heritage, and that her maiden name was Miers. I don’t remember any particular stories having been told about her, but she was someone somehow exotic to me. About five years ago, I was intrigued to discover through a distant relative, who was researching our shared Miers history, that Esther had been a writer. No author of note, but she’d written a story or two, it was thought. Where these stories might have appeared, though – in a private journal or newspaper or magazine – no-one seemed to know. Every now and again, I’ve done a trawl through the National Library’s Trove database looking for her, searching rags such as The Dawn, and the women’s pages of all sorts of publications. But found nothing. 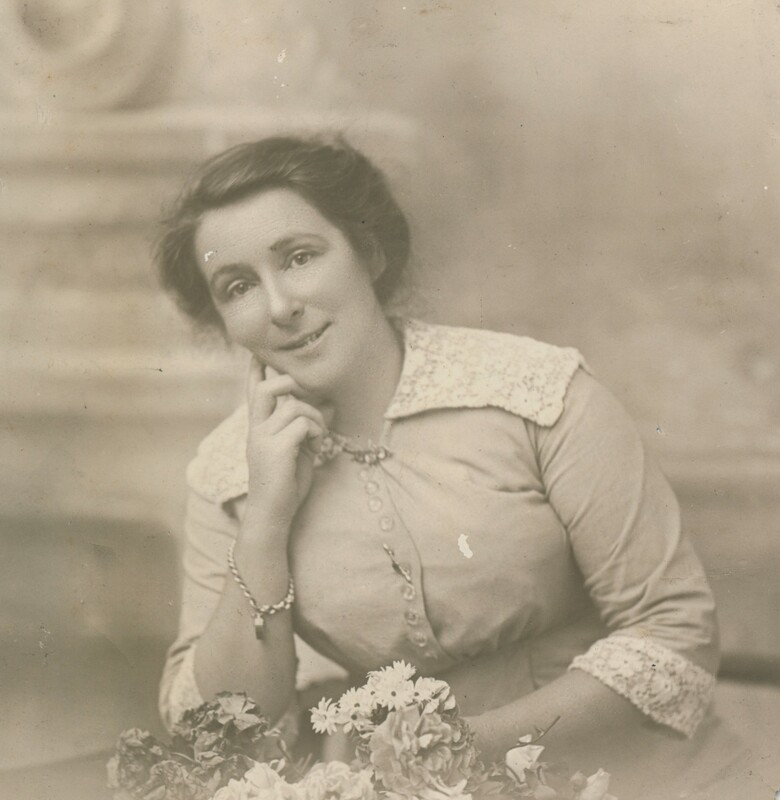 When I was recently contacted by another distant relative, a lovely woman called Andrea with whom I share this great grandmother, I asked her about Esther’s writing too, but she didn’t know anything about it. Andrea did send me this beautiful photograph of Esther, though – and it made me delve back into my small but incredibly untidy family archive for another wistful, hopeless hunt. What? Where’s the gold? And is this even what the lines say? The last of them is obvious, however, and ominous: And the world to an End shall Come in 1881. What the freak? 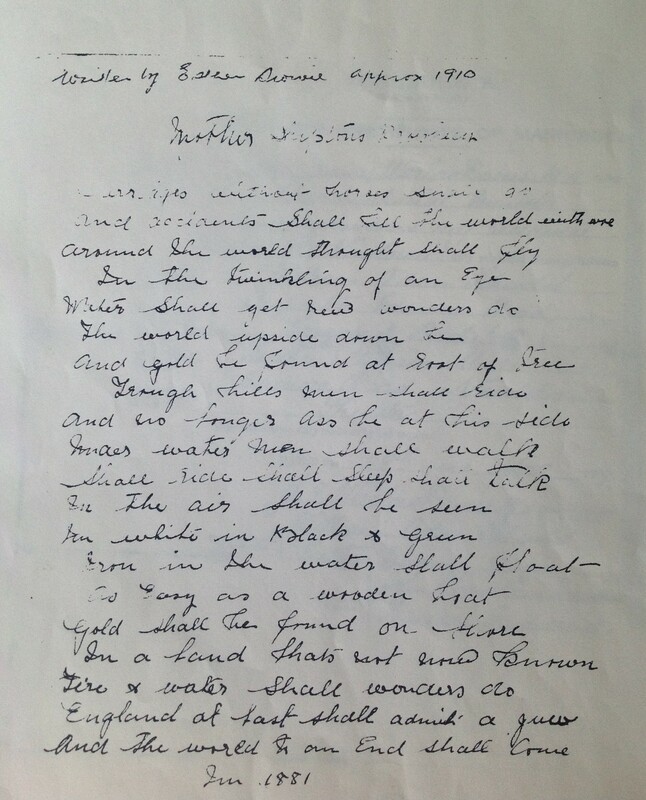 Who transcribed the poem, and what does it all mean? It’s an untidy nest of mysteries designed to taunt me, a treasure map made of invisible ink – that’s mostly what it means. It’s far from unusual, of course, that snippets of our creative lives get tossed out or lost after we move on from this world – especially the snippets of women. Our diaries and notebook scribbles, our love-splashed recipe cards, are probably among the first to go, when our grief-addled children are forced to sort through all our decades of junk. And so I make a promise to my own children now: any poem of mine, any piece of work I value, any thought I want to leave behind, will be typed up and copied to my hard-drive, fellas. Thanks for the shove along, Great Grandmother Esther. Perhaps that’s the only meaning I really needed to receive. Just telling my sister who has a house in Schwebel street, Marrickville and loves the history of the area.